Enter the first number in the addition or subtraction. The number can be a decimal number and can either be positive or negative. To enter a negative number, enter a minus sign in front the of the number (-25). To enter a positive number, enter the number without a sign. Enter the second number in the addition or subtraction. The number can be a decimal number and can either be positive or negative. To enter a negative number, enter a minus sign in front the of the number (-25). To enter a positive number, enter the number without a sign. This is the calculated result of adding or subtracting the two numbers. Scroll down to view a suggested method for setting up and solving the addition or subtraction. 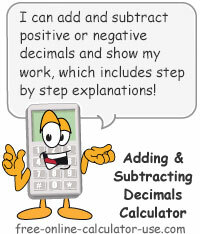 This calculator will add or subtract decimals, integers or whole numbers and show its work -- including an explanation for each step taken to arrive at the solution. You can also enter negative numbers and the calculator will explain how to set up the grid using absolute values, as well as which sign (positive or negative) will apply to the result. If you need to multiply or divide decimals, please visit either the Long Division Calculator or the Long Multiplication Calculator. Enter the first number in the equation, free of any commas, spaces or other non-numeric characters (only a single decimal point is allowed). If the number is negative enter a minus sign directly in front of the number (-25). Select either "plus" or "minus" from the operation drop-down menu. Enter the second number in the equation, free of any commas, spaces or other non-numeric characters (only a single decimal point is allowed). If the number is negative enter a minus sign directly in front of the number (-25). the "Add/Subtract Numbers" button and scroll down to see how the solution was reached using long addition or subtraction. The magnitude of a number without regard to its sign, represented by vertical pipes surrounding the number (|-5| = 5). In other words, the absolute value of -5 is the same as the absolute value of +5. If it helps, you can think of absolute value as being the distance from zero on the number line. How to add and subtract decimals and negative numbers without a calculator. In order to add and subtract decimal numbers without a calculator, both numbers must have the same number of decimal places. This is because the decimal points must line up in the solution grid in order to add or subtract the decimal numbers. If it turns out one number has a greater number of decimal places than the other, simply add zeros to the end of the number with fewest decimal places until it has the same number of decimal places as the other. This also insures that the sum of the two numbers will have the same number of decimal places as the number with the most number of decimal places. If one or more of the numbers in the addition problem are negative, the steps for adding the numbers depends on whether or not the signs of the two numbers are the same. Simply add the absolute values of the two numbers and give the sum the same sign as the two numbers. Add the absolute value of -7 (|-7| = 7) to the absolute value of -2 (|-2| = 2) to get 9, and give the sum the sign of the two numbers, which in this case is a negative sign. Using their absolute values, subtract the smaller of two numbers from the larger of the two numbers and give the sum the sign of the number with the largest absolute value. Subtract the absolute value of the smaller number (|2| = 2) from the absolute value of the larger number -7 (|-7| = 7) to get 5, and give the result the sign of the number with the largest absolute value, which in this case is a negative sign. If the problem is subtraction, change the subtraction to addition and change the sign of the last number to its opposite. Then follow the steps for adding negative numbers. Change (-7) - (2) to (-7) + (-2) and follow the rules for addition. Since the signs are now the same, add the absolute value of -7 (|-7| = 7) to the absolute value of -2 (|-2| = 2) to get 9, and give the sum the sign of the two numbers, which in this case is a negative sign. Change (-7) - (-2) to (-7) + (2) and follow the rules for addition. Since the signs are no longer the same, subtract the absolute value of the smaller number (|2| = 2) from the absolute value of the larger number -7 (|-7| = 7) to get 5, and give the result the sign of the number with the largest absolute value, which in this case is a negative sign. If you're not sure how to perform long addition or subtraction, the calculator on this page shows its work and includes the solution steps for each calculated result.